Cassie Hobbes: a seventeen year old girl has the unique ability to crawl into people’s heads and figure out even the tiniest detail about them, slowly piecing together their lives. 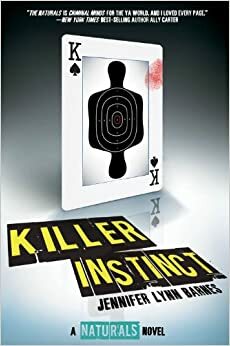 In Killer Instinct by Jennifer Lynn Barnes, five teens are training to work for the FBI as an elite group called the Naturals but they end up getting a little too close to the current case. A new killer strikes at Colonial University, Virginia, followed by a string of other murders assumed to be by the same person. The main character, Cassie is the profiler, and her mother was presumably murdered. Cassie’s roommate, Sloane, is a statistics expert, with a liking for caffeine. Lia is the human lie detector with an attitude. Michelle is the emotion reader with a knack for finding trouble, and Dean, who has the same ability as Cassie, is the son of Daniel Redding, a serial killer. The group keeps trying to solve the case even though they are told to stay out of it, until they dive in a little too deep. Killer Instinct by Jennifer Lynn Barnes is a page turning novel filled with murders and mysteries. While reading the book, I enjoyed the sections in which Barnes wrote in the killer’s point of view because it made the novel much more mysterious and kept me reading until midnight. However, because of its gory details, I would recommend this book to a more mature audience. Killer Instinct will keep you on your toes and looking out for any possible murderers.